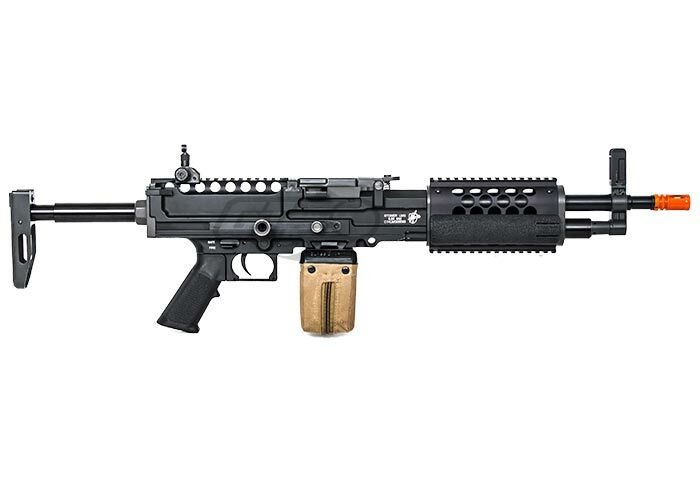 The Stoner LMG by Knight's Armament is the ideal choice when it comes to fulfilling the support weapon role. Externally, the entire gun is made out of metal. Towards the rear of the gun, the adjustable six position stock adds comfort to any user. The center of the gun features a solid metal body as well as an electric auto feeding 1200rd box magazine to aid in suppressive fire. The rail system, also constructed out of metal is readily available for mounting optics, grips, and other accessories needed. 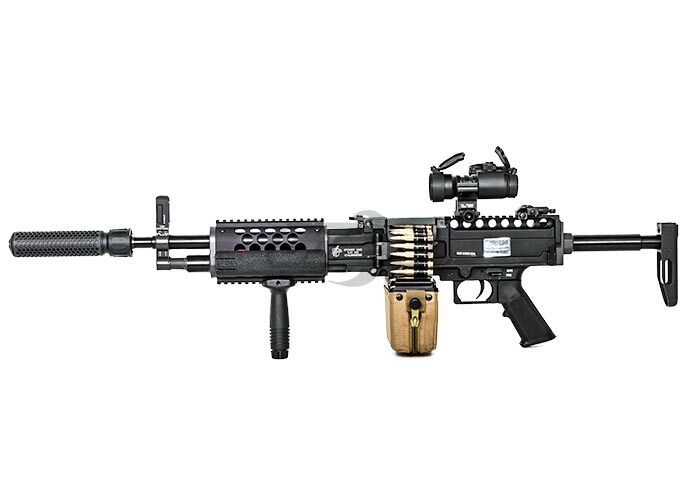 The Knight's Armament Stoner LMG features a new design reinforced full metal gearbox. A quick detach outer and inner barrel allows the user to easily upgrade for increased range and accuracy. The new trigger mechanism allows for a more reliable setup as well as increase in response time. 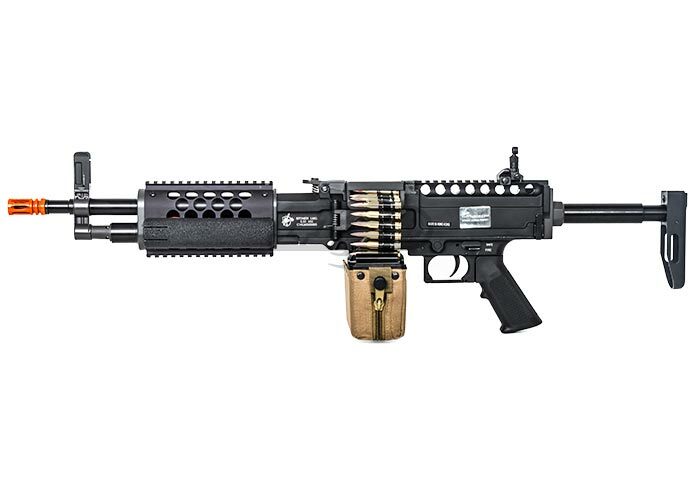 Overall, the Stoner LMG is a well built airsoft gun by Knight's Armament and an ideal choice for the support gunner role. Optic, dummy rounds and barrel extension are NOT included. This gun the best LMG i have ever owned, i own a custom M249 para,M60VN,Mk43 M60, G&P RPK and this gun beats them all. when you first open this gun up the packing is great!!!!! the build quality on this gun 10/10 and i the feeding system works perfect i put a 11.1 lipo in my gun to see if the intenals would hold up and it did great, thats another thing takeing apart this gun is EXTREAMLY easy and thats inportant for a support gunner, all in all if you got the cash GET THIS GUN best LMG ever!!!!!! 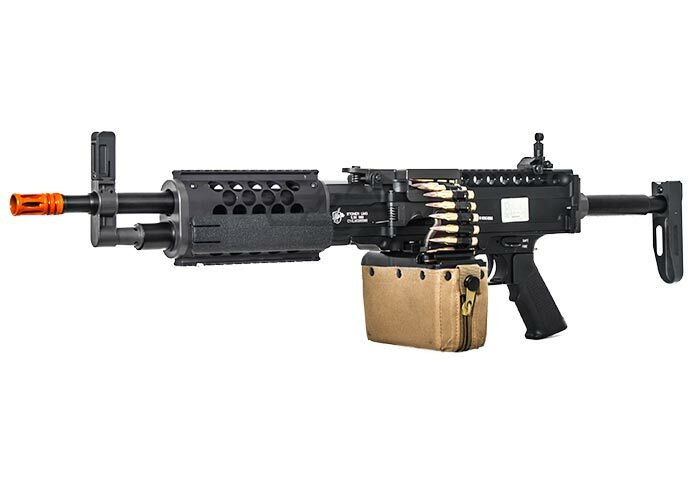 By far, the lightest LMG on the market, every time someone tries it, they are surprised by its performance. box mag is very easy to load, so don't worry about reloading during battles. hop up arm broke once. My thought about this weapon: After several days on the field, the gun and box magazine did not disappoint me - together they're dependable. However, this is a gun that will need a LiPo battery or is just another semi auto weapon on the field - 3 capture the flag battles exhausted 2 NiMh batterie. My brother has an M-60 (LiPo) and although heavy, it's a true support weapon, dominating the field and the Stoner just doesn't intimidate anyone- it's more of a 'heavy' M-4 (with magazine box)...an unusual mutation..for what you save in weight, you loose in the small magazine box. 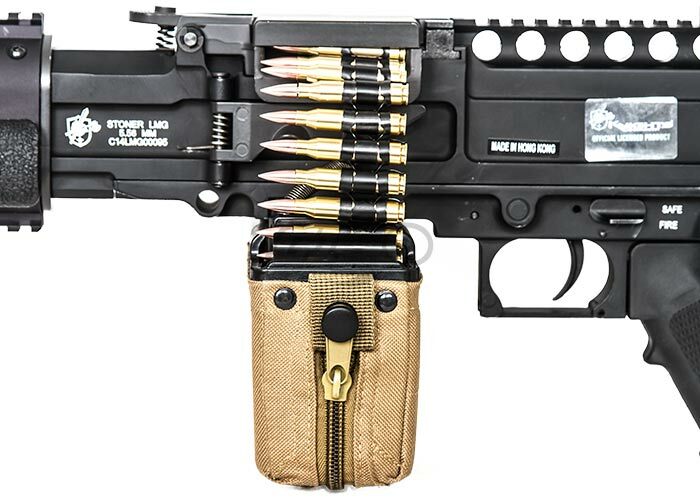 As for now, I wouldn't buy it again unless they can figure out something with the stock, place a bigger magazine box on it and add points for a sling. Good 'basic' all metal gun out of box. 2. Rail rear sights - can be removed. 4. No sling points - sure it's light weight but couldn't a few attachment point have been installed? 5. If you're big with long arms, the weapons will feel/seem short. 6. The battery compartment limits you choice of batteries. Where can I purchase Dummy Rounds? What dummy rounds does this gun take 5.56 or 7.62? 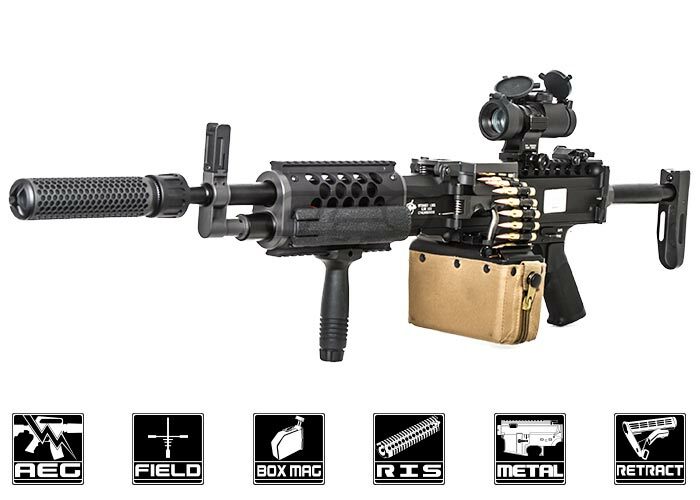 Does the box mag take a battery? 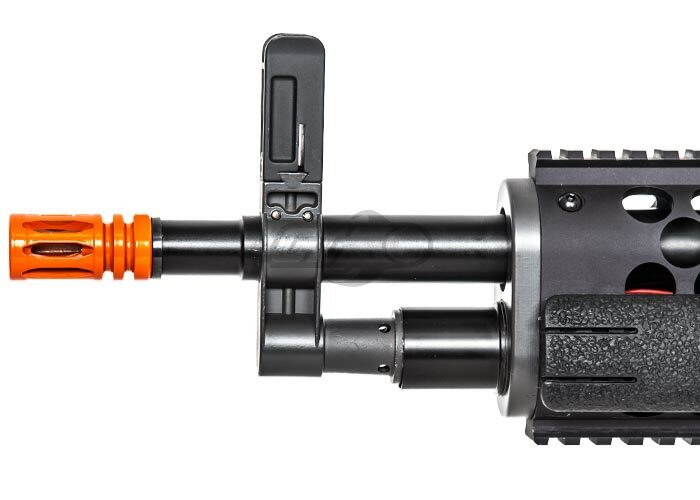 Does the box mag take a battery or does it connect to the guns battery? and if the box mag does take a battery what type of battery? What are the types of battery that will fit? The battery for these guns is housed in the front, and sits directly under the outer barrel within the RIS system. A stick-type LiPo is the best bet for a correct fit. Will this be in stock by november 30th? I'm wondering for tanksgiving. And do you know if there will be any coupon codes for december that have 23% off? Thanks! What threading is on this gun? 14mm clockwise or counter clockwise? It should have 14mm CCW threading. WILL A 9.6v STICK BATTERY FIT? And why does none of my questions appear when I ask them? can you put a longer outer barrel? Can it use 9.6v nimh stick battery? Can I put a 9.6v NiMH Stick-Type battery in this gun? What type of lipos would fit in this gun's compartment, and what ones would you recommend? 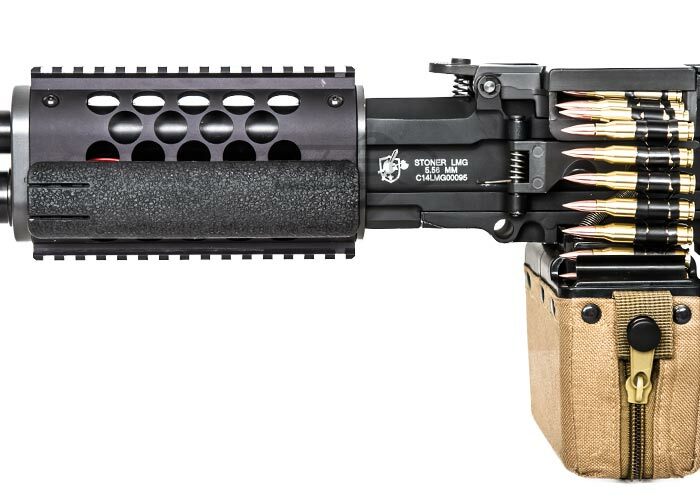 can the stock be removed and replaced with a m4 buffer tube? Want to know before I buy. We are not aware of a buffer tube adapter for this airsoft gun. This cannot take M4 magazines. And can it go semiauto? No semi and it's usually around 370-400 fps. Like most airsoft guns, you can replace the internals with a lower tension spring for a lower FPS. Will this gun support a polarstar? 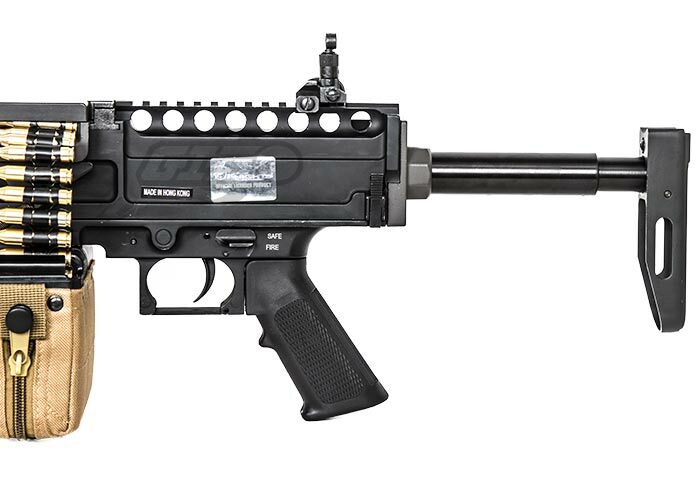 If this gun can support a polarstar engine what type would it be?